At the beginning of each session, you will be comfortably fitted with a harness designed to achieve optimal decompression of the low back or neck. During a session of spinal decompression you will notice a slow lengthening of your spine as your discs are gradually decompressed and relieved of pressure. The treatment process is safe and relaxing. While some patients with extensively injured discs have reported mild discomfort during the first few treatment sessions, their discomfort subsides upon subsequent visits. A patient safety switch provides an extra safety feature, allowing you to stop at any point should you feel discomfort. Each treatment session lasts approximately 30 minutes. Individual patient results may vary. 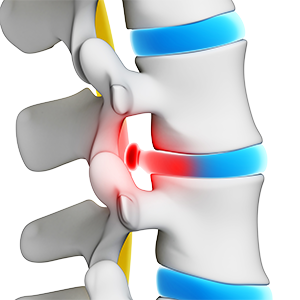 A typical spinal decompression treatment protocol consists of about 20-24 sessions over four to six weeks. Some conditions require fewer visits; some require more. Many patients report relief from their pain and other symptoms during the first few treatment sessions, and most experience dramatic pain relief after completion of their prescribed treatment program. While traction, physical therapy, and manipulation may reduce disc pressures to as low as 40 mm Hg, only spinal decompression has been shown to achieve negative pressures within the spine. It has been clinically proven that spinal decompression creates negative pressures as low as -110 mm Hg3 within the injured disc during the treatment session. Normally, pulls exerted on the spine trigger sensory receptors in the back to tighten the muscles surrounding the vertebrae and discs in an effort to protect them from injury. Spinal Decompression bypasses this response by slowly pulling on the spine and relaxing the back over an extended period of time, allowing the discs to be repositioned without tension and without causing spasm and muscle guarding. It is important for patients to make sure that they are treated on a high quality true spinal decompression table by a physician with years of experience and not an imitation spinal decompression table. Patients enrolled have an average of ten years of chronic back pain. Yes! Professional athletes, celebrities and even patients in their 90s are turning to spinal decompression and cold laser therapy as an affordable, non-surgical alternative to neck and back pain without the use of drugs, pills and surgery. People are tired of taking pills that simply mask the pain and can cause all kinds of serious side effects. People are frustrated with getting shots that work the first time or two and then eventually have minimal or no effect. And people are scared to death of surgery as they have seen firsthand as their friends and relatives who spent 1,000s of dollars, had weeks of down time, have scars, and risked serious side effects and still ended up with a failed back surgery syndrome. New non-surgical spinal decompression is not only effective and affordable but is also non-invasive and safe. On my first visit, I pretty much needed to be carried in by two people. I am a grown man and I actually had to use a walker just to get around because the pain was so bad. The pain I felt was indescribable. An MRI showed an L5/S1 disc herniation. I had the same thing 2 years back and it took over a year to fully recover. My first visit of spinal decompression was very painful and felt no relief. The 2nd visit gave me much relief and by the end of the first week, I could walk without help. I looked forward to each day because I knew I would feel better each time. The Doctor knew just what to do to help me. I was so happy that the visits were so relaxing and each provided more relief from the pain. I have never been to any Doctor of any kind that really cared this much. Instead of it taking a year to heal this time, I was back 100% within 2 months. I first came ... with a Lumbar Disc Herniation after a weight lifting injury. The pain was pinching and piercing down my right leg. It caused abnormal nerve sensations and led to a decrease in life enjoyment. I had a significant amount of numbness and tingling radiating down my leg as well. On a scale of 1 to 10, the pain was a 7. I tried Chiropractic care, pain meds, exercise and an inversion table. Seriously, nothing helped. I decided to take matters in my own hands.... My first concerns were if the treatment would work for me and if I would need to come in for the rest of my life. My recovery process has been both fast and enjoyable. As a result of my treatment, I now enjoy daily exercise, time with family and can finally sleep soundly at night! The only drawback is that now I can no longer use my back pain as an excuse to miss family reunions. I had a herniated disc at L3 and L5, according to my MRI. My right side was in excruciating pain from my disc pushing on my sciatic nerve. My foot was numb and tingly all the time. I was in the E.R. every weekend. I was taking all kinds of pain pills, was in a wheelchair for 2 months and used a walker for 1 month. I knew the pills could cause damage to my liver and kidneys but I didnt know what else to do. They were also becoming very addictive and that made me scared. I was three days from having back surgery when I saw an ad in the newspaper. I came down to the office and the Doctors explained everything. The Drs put me on the Decompression Table and only 6 weeks later my back and leg feel wonderful. No more pain pills for me. I cannot say enough about Spinal Decompression! I recommend it to anyone with back or neck pain.